I thought about posting this on the five year anniversary of the day in question. But things (and the tournament scheduling) have since moved on. 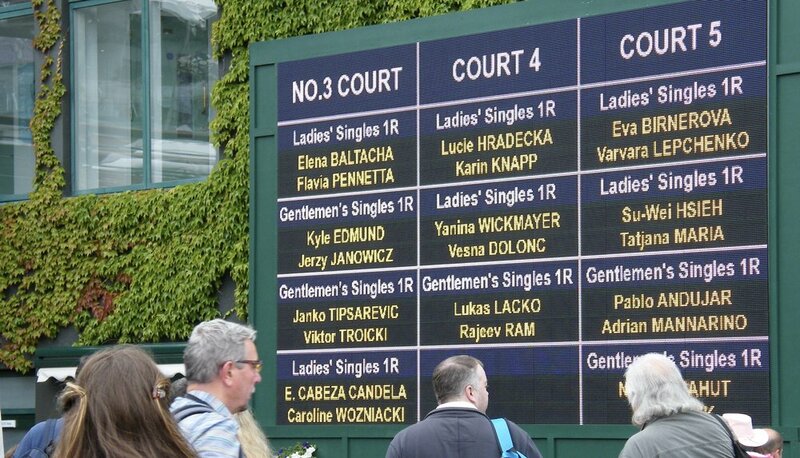 Wimbledon now opens its gates to the Championships later, right on the June/July changeover... but still sometimes clashes with the World Cup of (Gentle? )Men's Football as it has this year. But let's go back five years to my ninth visit to the Championships. You know, the Championships where all the players say that this is their favourite. Which is what they said at all the previous tournaments for the previous twelve months. Except that at Wimbledon they truly mean it! The special feeling at SW19 is tangible. Wherever you look the public is soaking up a tradition which continues to deliver drama and excitement through one of the most attritional sports which does not allow body contact. The dark green and purple colours are now over a hundred years old and the buildings, logos and uniforms they adorn have evolved but I cannot think of another organisation which has managed to change so much without jangling or threatening the perfect polish of a British summer icon. In through Gate 7. Court 11 is right on that corner so we saw quality straight away... even if it was just a practice session with Ivanisevic, Cilic and Federer. 10:56 - At least three Grand Slam champions. Our No. 3 Court schedule on the day... accent on the Brits! 11:12 - Ann Jones walks across No. 3 Court. Ann Jones, winner of the Ladies Singles at the first Wimbledon which I attended in 1969 and now vice president of the All England Lawn Tennis and Croquet Club. I still regret that I did not stand up on the day and applaud a great champion. It looks like the guy in the white cap recognised her too. We were up in the high seats with a view over the back to the area in front of Centre which allowed a few pictures of events away from our particular court. 11:15 - Officialdom... officially being reminded how to officiate? 11:25 - Fognini leads across the concourse... but Melzer was to end up with the win on court: 6-7, 7-5, 6-3, 6-2. Our first match was imminent. It heralded the first of our 'Brits'. 11:28 - Elena Baltacha's escorted arrival. 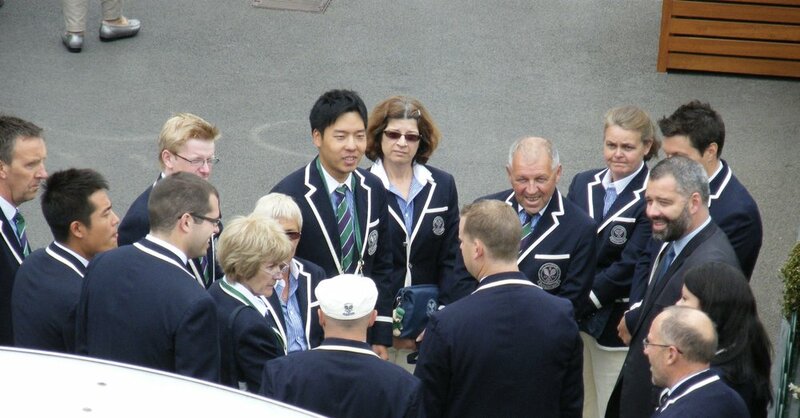 Judy Murray (captain of the British Fed cup team at the time) and Jeremy Bates wait with interest and expectation. Slightly chilly, but chilled, ground staff galvanise for action. Flavia Pennetta had only started the season in February after wrist surgery the previous August. She was still a 'Lady In Waiting'. She survived in this championships until the fourth round but in September 2015 she would win the US Open, breaking the record for most appearances in a Grand Slam tournament before winning... at her 49th attempt. The marvellous game of tennis as we appreciate it so little of the time... away from a television broadcast screen. 'Being there' is so very different from the experience which is broadcast to our homes. As soon as the first knock-up balls are hit you realise the true size of the court. The qualities of control, power and athleticism on display seem magnified. It is the same game as is being watched by millions around the world but only the few thousand in the arena can truly appreciate each seemingly protracted stroke. The sound of strings brushing up on ball to give maximum spin and control is suddenly so obvious. If you shut your eyes you could still describe the players' court movement by tracking the sound of padding feet with your ears. The buzz of having a huge throng enjoying the same stunning shot is far superior to a lonely shout at a screen in the corner of your living room. Elena Baltacha had notched a couple of victories over top ten players in 2010 but an absence due to knee surgery was one factor which had given her tennis career an uneven look. It was not to be her day under our watch. 12:55 Handshakes all round as Pennetta eases through 6-4, 6-1. We had seen Elena's last singles match at Wimbledon.She would retire in November and marry her coach, Nino Severino, in December. Tragically, she was then diagnosed with liver cancer and lost her biggest challenge when she died on 4 May 2014 at the age of 30. The foundation which she set up "... to give more children, from all backgrounds, the opportunity to learn to play tennis" can be found at the link here. You can still help to fund it. A break outside with a first proper nibble at our packed lunches. And a brief encounter with the US Open champion for 2014. 13:00 - Marin Čilić ready to start his campaign with a straight sets win over Marcos Baghdatis... only to give his next opponent a W/O on 'Black Wednesday'. A potential five sets as the second match got under way. 13:00 - Jerzy Janowicz poses with a reasonably tall umpire for appreciation of his 6ft 8in height. Kyle Edmund accepts defeat in that department. 13:05 - No commentating, just spectating from Barry Cowan and a watchful eye from Greg Rusedski who, a short while after, would become Edmund’s coach… for a short while. Powerful serves. Edmund already practising the Murray cap shift. Handshake and off at 14:38. Early ATP tour days for eighteen-year-old Edmund. In 2017 umpire Arnaud Gabas would call score in another Edmund match… and become the unfortunate recipient of a ball struck in youthful petulance by Denis Shapovalov. This Wimbledon match passed more smoothly. Especially for Janowicz who cruised along in three (2, 2 and 4) and carried on his campaign to become the first Polish male to reach a Grand Slam semifinal. We left our seats again after this match, stretched our legs and saw what was happening around the grounds. First on the practice courts at Aorangi Park. 15:10 - Heather Watson changes to her left hand and adopts an unconventional grip. Sabine Lisicki looks determined to make it all the way to the final... which she did, of course. 15:23 - Much security kerfuffle at the gates as someone points out that the All England Lawn Tennis Club's initials have been installed backwards. 15:28 - Jonathan "Jonny" Marray caught on his mobile... maybe still texting friends about his Wimbledon Men's Doubles victory with Frederik Nielsen the previous year. We had well over an hour away from the third match on No. 3. I'm sure we included a mandatory Pimm's in our refreshment. In our absence another ‘Brit’ had been ably looking after things. James Keothavong was in the chair. 15:57 - We have enjoyed much warmer weather at Wimbledon but this was a slightly chilly full day's play. Playing for personal pride instead of country this time... Viktor Troicki and Janko Tipsarević. We had missed almost two thirds of this match. Tipsarević forced a tie break in the third but left without a set. 16:48 - Commiserations from Troicki, congratulations from Tipsarević... and still Serbian sidekicks. This pair had helped Serbia to their first Davis Cup final in 2010 with Troicki clinching Serbia's win in the competition in the fifth rubber. Perhaps Tipsarević pondered more on his Wimbledon defeat when Troicki was banned for a year just weeks after this match for failing to provide a blood sample at the Monte-Carlo Masters event. Staying in our seats for the final match. But first more pics over the stands from our high vantage point. 16:51 - Oh... Darcis up a set on No. 1 Court. Nadal won't stand for that much longer, eh. 16:53 - Nicolas Mahut trails behind Jan Hájek... but he'd had three years to reflect on defeat in the longest Wimbledon men's match against John Isner and didn't intend a repeat. Straight sets win... 6-2, 6-4, 6-3. 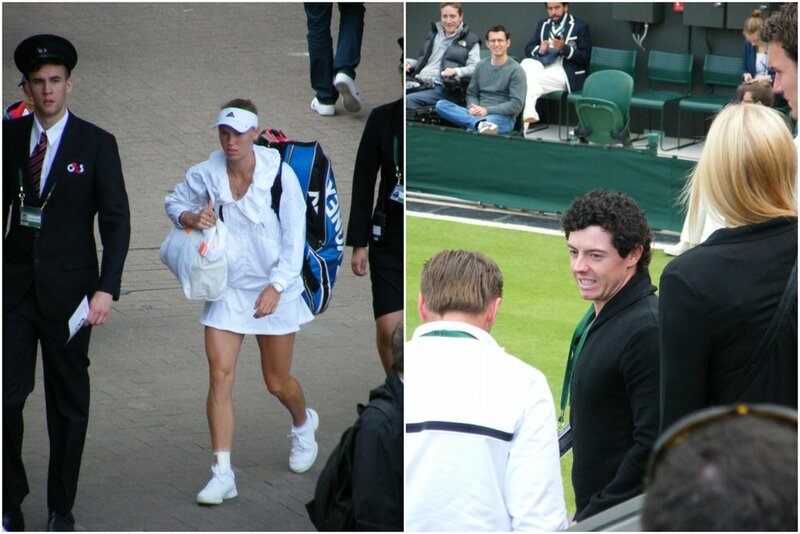 16:54 - Caroline Wozniacki looks purposeful as she approaches court... Rory McIlroy waits to watch. Spaniard, Estrella Cabeza Candela, was about to play her first and only singles match at Wimbledon against the ninth seed, Caroline Wozniacki. She suffered a first set bagel and took two games before bowing out. Wozniacki has subsequently gained her first win at a Slam in Australia 2018. Her three-year relationship with McIlroy finished early in 2014 which also seemed to end the sporting slump they had both suffered in 2013. Time to check the scores elsewhere between sets one and two. 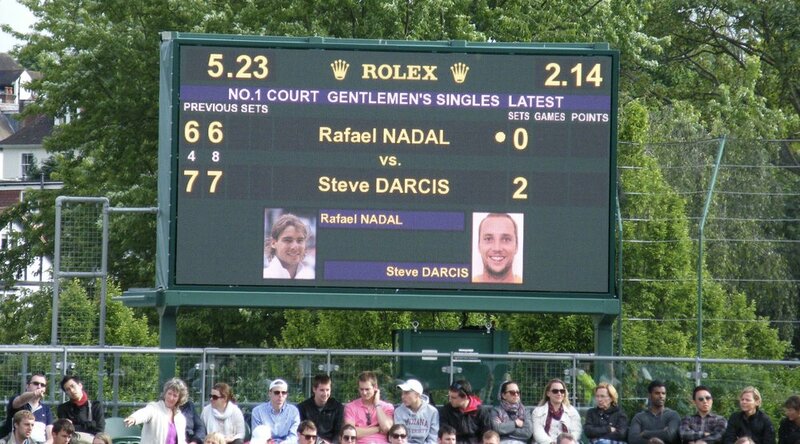 17:23 - The scoreboard from No 1 Court continued to make us wonder when Nadal would grind his way out of trouble. Steve Darcis was relentless and took it in straight sets, 7-6, 7-6, 6-4. A big shock on Day 1 but more would come two days later with a Federer defeat and several withdrawals. Not a deliberate attempt to contrast the relative statures of these two players... but there was an evident gulf in performance on the day. All matches were now completed for our court and we created no unattended packages as we prepared for a last look at Wimbledon 2013. It has been our privilege to see Andy Murray once at the end of year ATP Finals and twice at Wimbledon. We were content to watch the end of his 2013 opening Centre Court match on the big screen. The Becker who is Benjamin not Boris could not find enough resistance to cause any shock and Murray was on his way. 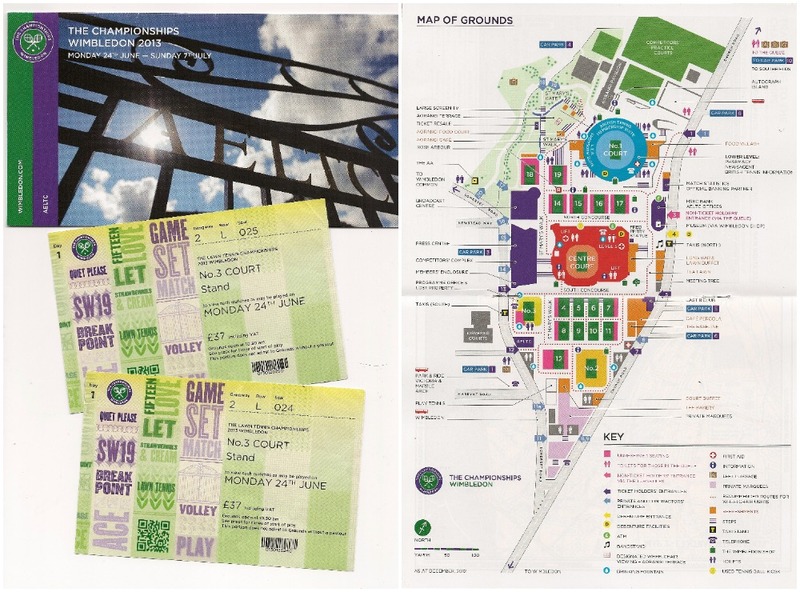 18:35 - Aorangi Terrace, Henman Hill?... it was Murray Mound when we passed by. The power and aggression of Janowicz had impressed us. It created enough worry eleven days later to threaten Murray when they competed in the semi-final. That’s enough spoiler for now. I’ll leave you to remember (or find out!) if Murray went on to end 117 years of Scottish wait for what BBC sport writer Tom Fordyce called "the 'holy grail' for British sport". Speaking of writers, it would be remiss of me if I didn’t acknowledge Chris Durning here. Recently accredited with journalist status, his reports from this year’s Nature Valley Nottingham Open gave me great enjoyment… and the nudge to compose my own piece about the sport I have loved to play and been so lucky to watch at the highest level. 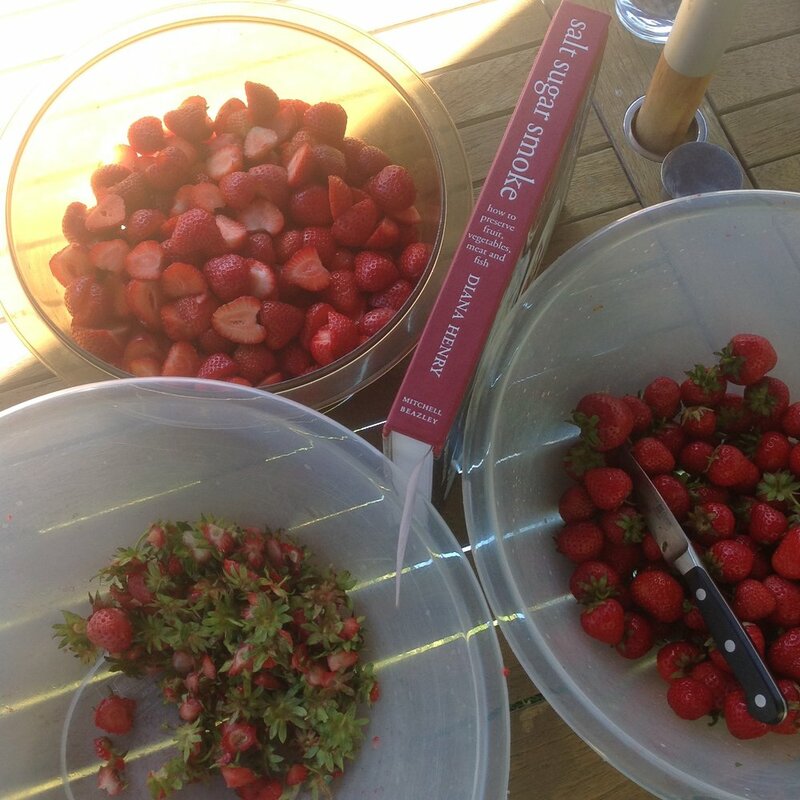 We soaked up the Wimbledon atmosphere for a few last minutes and reflected on the day. A ticket on first Monday necessarily sees the top players spread further than the main show courts. And at this level of Grand Slam competition you are guaranteed to watch compelling performances of the highest standard wherever your seat. My Mum lives conveniently close, south of SW19, and we chose to leave in time for dinner back with her. As ever, The Championships had delivered its magic. 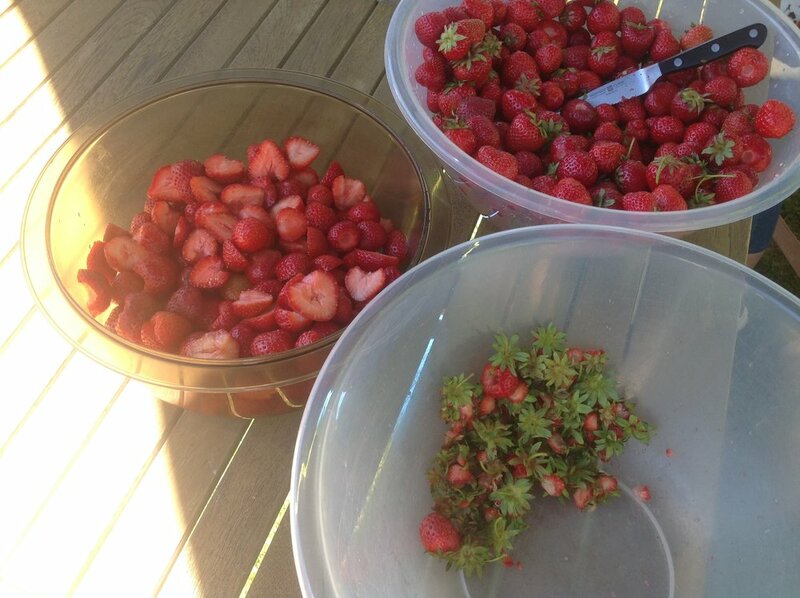 A summer picnic on grass is a glorious enough thing... but tennis on Wimbledon's green stuff is totally unbeatable.